Snapshot of OUR great Cause! On this page is a great Executive Summary of what our historic endeavor is all about! Click the button below to see how you can help & be a part of history in the making! Recognition sought for segregated Latino-American military unit! "Simply put, the 65th Infantry Regiment Borinqueneers are the Latino-American equivalent of the famed Tuskegee Airmen and Navajo Code Talkers. 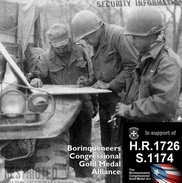 The Borinqueneers must be recognized in like fashion with the Congressional Gold Medal, & take their rightful place in American history NOW!" 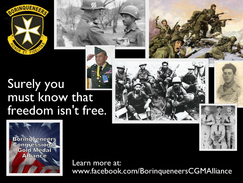 Click on Borinqueneers visual to enlarge! 65th Inf. Reg. Co. B Weapons Platoon in Korea, 1950. 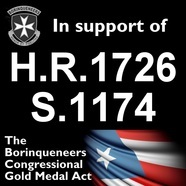 New Co-Sponsors of bill H.R.1756 in the US House of Representatives have put the Borinqueneers Congressional Gold Medal Alliance (BCGMA) at 301 or 104% of the 290 Co-Sponsors needed to further the House version of the Borinqueneers Congressional Gold Medal Act, the alliance reported on April 20th. The U.S. House of Representatives bill was introduced this spring by Representatives Pedro Pierluisi (D-PR) and Bill Posey (R-FL). The U.S. Senate companion bill, S. 1174, was introduced in June by Sen. Richard Blumenthal (D-CT), and has 53 of the necessary 67 Co-Sponsors. This type of legislation requires two-thirds of the membership of each chamber of Congress to become Co-Sponsors for possible passage of the bills. All necessary, remaining U.S. Senate Co-Sponsors must be secured as early as possible in 2014, and additional Congressional protocols must be completed for passage of the bills before the end of 2014, or the bills will disappear. Similar in nature to the famed Tuskegee Airmen and other segregated U.S. military units, the 65th Infantry Regiment Borinqueneers were the largest, longest-standing, and only active-duty segregated Latino military unit in U.S. history. 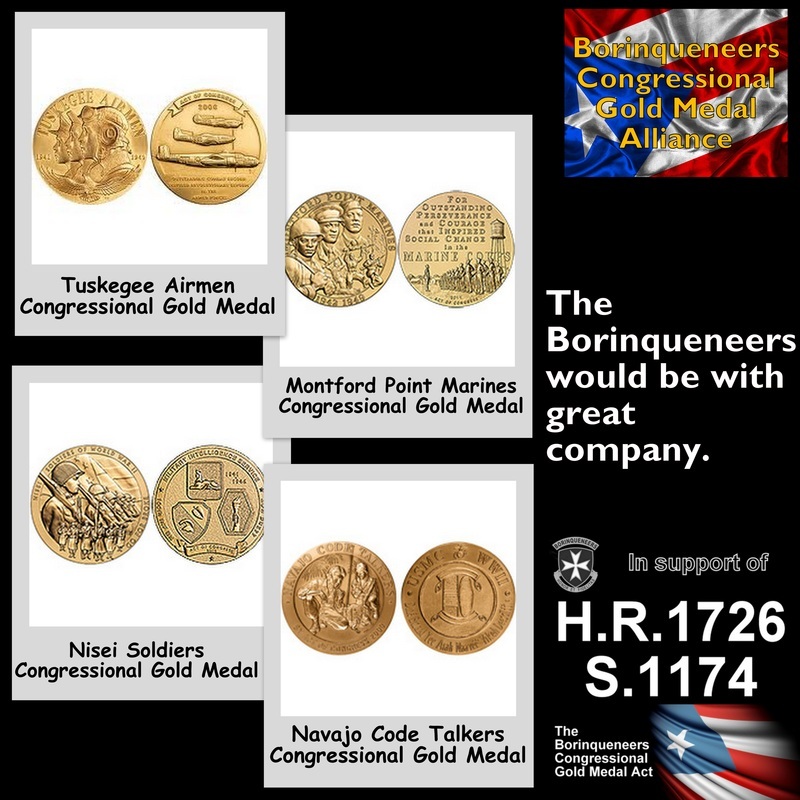 Like the Tuskegee Airmen, Navajo Code Talkers, Nisei Soldiers, and Montford Point Marines who’ve already been recognized with the Congressional Gold Medal, the Borinqueneers overwhelmingly distinguished themselves in battle all the while enduring the additional hardships of segregation and discrimination. Hailing from Puerto Rico, the US Army unit was active from 1899-1959. Emblematic of all US military veterans, including the hundreds of thousands of Latino-American veterans, the Borinqueneers served and sacrificed in the cause of freedom with great pride The youngest of these remaining Latino-American heroes are in their 80’s and 90’s, having served in World War II & the Korean War. 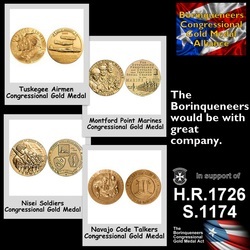 A nationwide, non-partisan, all-volunteer group, the Borinqueneers Congressional Gold Medal Alliance has been advocating the awarding of the Congressional Gold Medal to these elderly veterans since late last year. Made up of veterans, Latino-Americans, and like-minded patriots, the organization has worked closely with members of the U.S. Congress to facilitate the successful introduction and subsequent support of this special bipartisan legislation. The alliance’s national chair, Frank Medina, a 2002 West Point graduate and Iraqi war Veteran, is coordinating intense efforts this winter to encourage individuals and organizations to reach out to additional Members of Congress, especially Senators, to request their Co-Sponsorship of the bills. 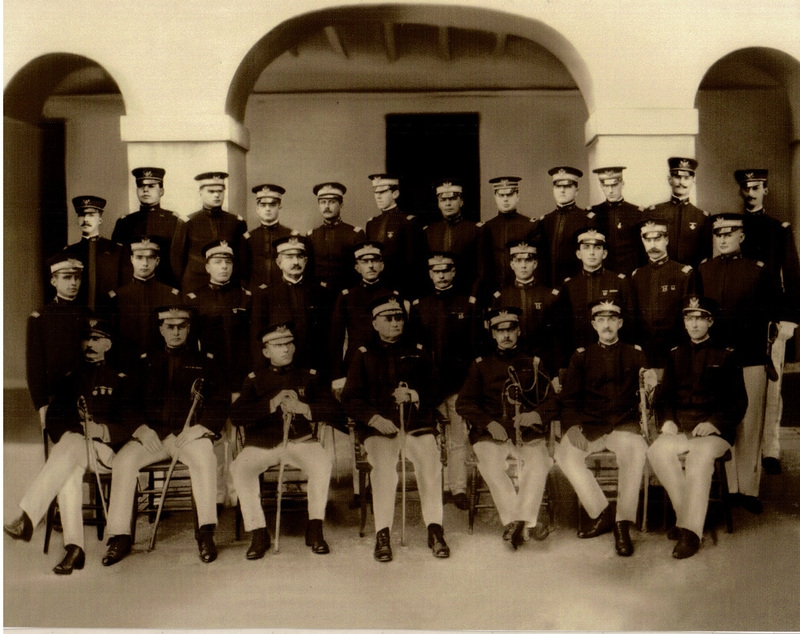 Officer Staff, "Porto Rico" Regiment, 1906. 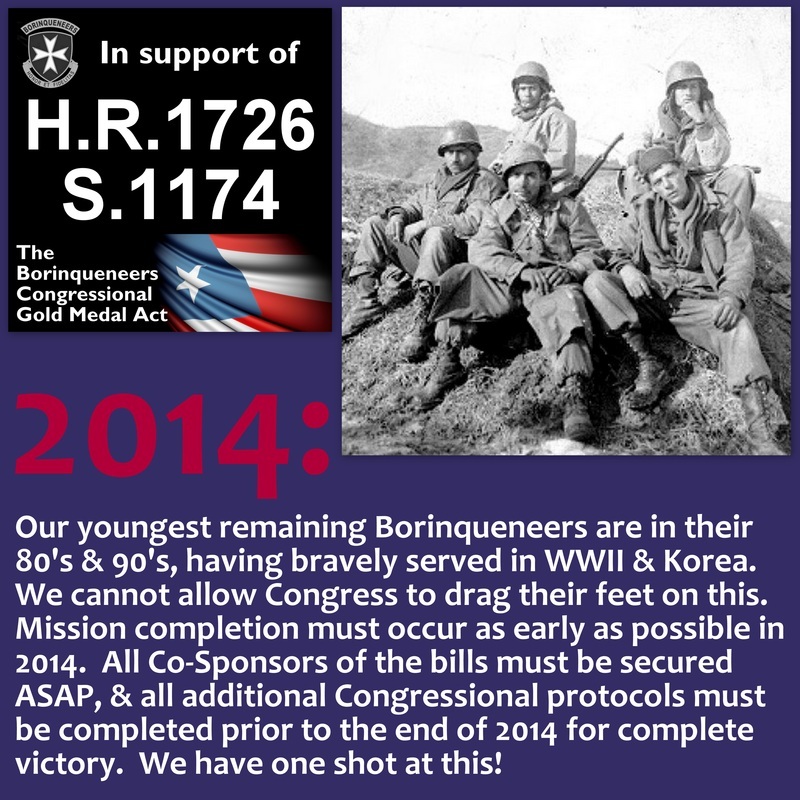 During the Korean War, 2,771 Borinqueneers earned Purple Hearts. 750 of them were killed in action, and more than 120 are still missing in action. In addition to the points cited in the bills, the Borinqueneers were forced to wear “I am a coward” signs, ordered to paint over their unit designation “Borinqueneers” on their military vehicles, and ordered to discontinue their rations of rice and beans, termed “creole rations” at the time. AARP, League of United Latin American Citizens (LULAC), Vietnam Veterans of America (VVA), American GI Forum (AGIF), Association of the United States Army (AUSA), Military Order of the Purple Heart (MOPH), National Puerto Rican Coalition (NPRC), National Puerto Rican Chamber of Commerce (NPRCC), National Guard Association of the United States (NGAUS), National Council of La Raza (NCLR), National Association for Uniformed Services (NAUS), and Hispanic American Police Command Officers Association (HAPCOA). 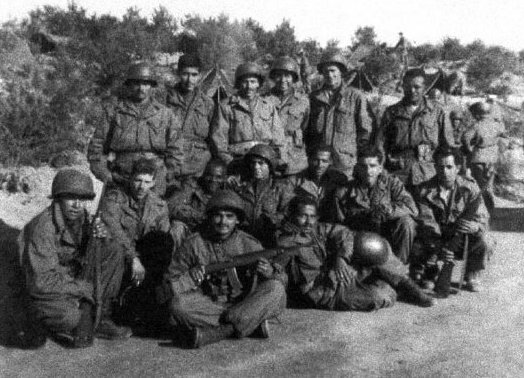 Although comprised mainly of Puerto Ricans, during the Korean War, the Borinqueneers also included some Mexican-Americans, African-Americans, Filipinos, Virgin Islanders, and several other nationalities. Interestingly, our nation’s first and only Latino 4-Star Army general, Richard E. Cavazos, a Mexican-American, got his start as a young Borinqueneer officer in Korea. There he earned his first of two Distinguished Service Crosses, our nation’s second highest honor for individual heroism. "Fijar bayonetas!" Click on painting to enlarge! 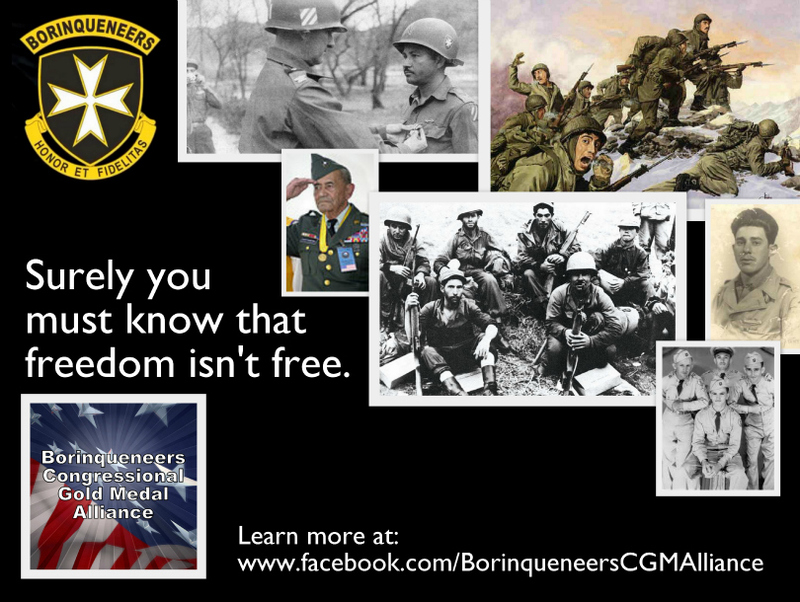 The Borinqueneers are credited with the final regimental bayonet assault in US Army history. In early 1951 while fighting in Korea, two battalions of the 65th fixed bayonets and charged straight up hill toward the enemy, over running them and overtaking the enemy’s strategic position. General Douglas MacArthur had high praise for the segregated unit. It was recently learned that MacArthur several years earlier had tried to get the Borinqueneers assigned to him in the Pacific during WWII, but the Pentagon denied his request because of prejudice toward the 65th. 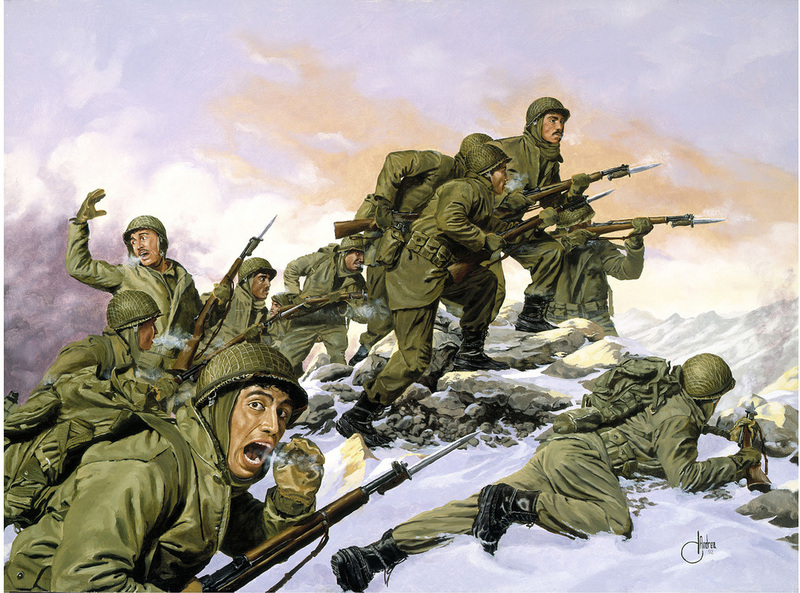 Also during Korea, the Borinqueneers valiantly defended the rear-guard of the retreating 1st Marine Division in one of the epic military withdrawals of history and were the last ones to board the retreating ships at Hungnam. Another interesting fact is that of the 155 Congressional Gold Medal recipients since 1776, only one has been a Latino-American. That was forty years ago. Even though this will be a first for many of us, the alliance is asking everyone to immediately contact your two U.S. 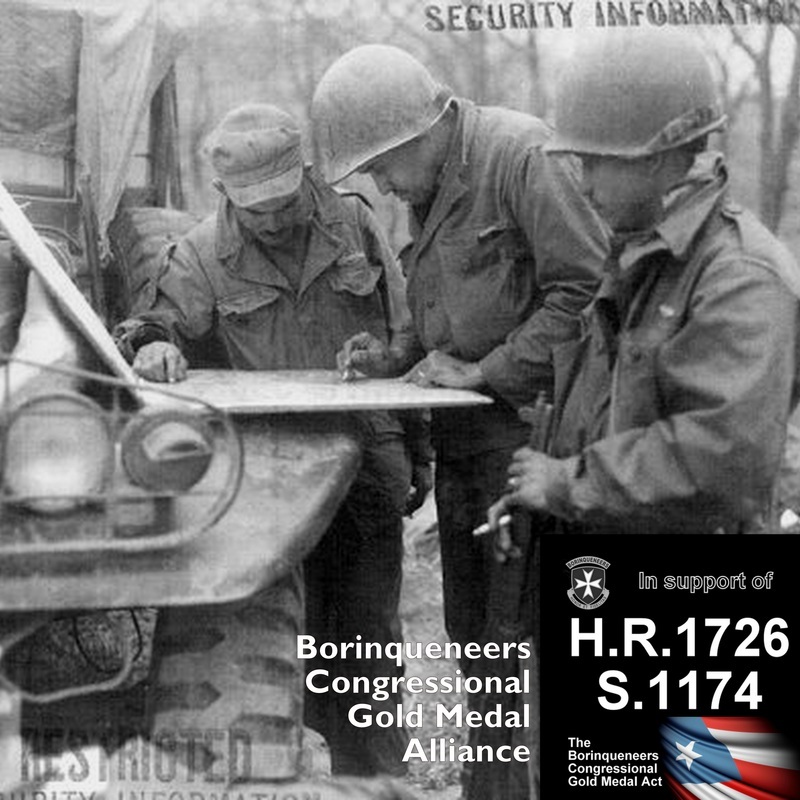 Senators to request their Co-Sponsorship of the bills that would award the Congressional Gold Medal to the 65th Infantry Regiment Borinqueneers. Information on how to identify and quickly and easily contact your Senators via phone calls, letters, or their email web forms is available here. Thank you! Quotes from Mambo on Hill 167, a captivating story of heroism & sacrifice despite prejudice, by Bart Soto, alliance national steering committee member, author, & historian. Follow this link to read the story & learn more about the legendary 65th Inf. Reg. Borinqueneers in our Special Hispanic Heritage Report! Contact Congress NOW! Click pic for details! This MUST be the year! Click visual to enlarge! SUCCESSFUL MISSION COMPLETION is essential in 2014, or the bills in Congress will disappear. YOUR HELP is needed NOW! Go directly to our current major objective! Click on visual to enlarge! "We will NOT allow the legendary Borinqueneers to become a fading footnote in American history and in the history of Latino-Americans and Puerto Ricans in the US." 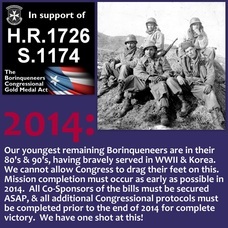 The Borinqueneers have merited the Congressional Gold Medal! They paid a high price for our freedom. NOW IT'S TIME WE PAID THEM BACK JUST A LITTLE. Hailing from Puerto Rico, the Borinqueneers were the largest, longest-standing, and only active-duty segregated Latino-American military unit in US history, having fought bravely in WWI, WWII, & Korea. They endured the hardships of segregation & discrimination while at the same time being heroes in battle. Honor them. Thank you! See and/or Download 1-Page Historical FACT SHEET! Click on LTC Dickerson visual to enlarge! Julius Dickerson (LTC ret. ), 91, graduated from Howard University as an architect. A WWII & Korea veteran, this African-American was an artillery officer, and served as the executive officer for the Borinqueneers Artillery “Cannon” company in Korea. He also designed encampment layouts for the 65th Inf. Reg. Borinqueneers. 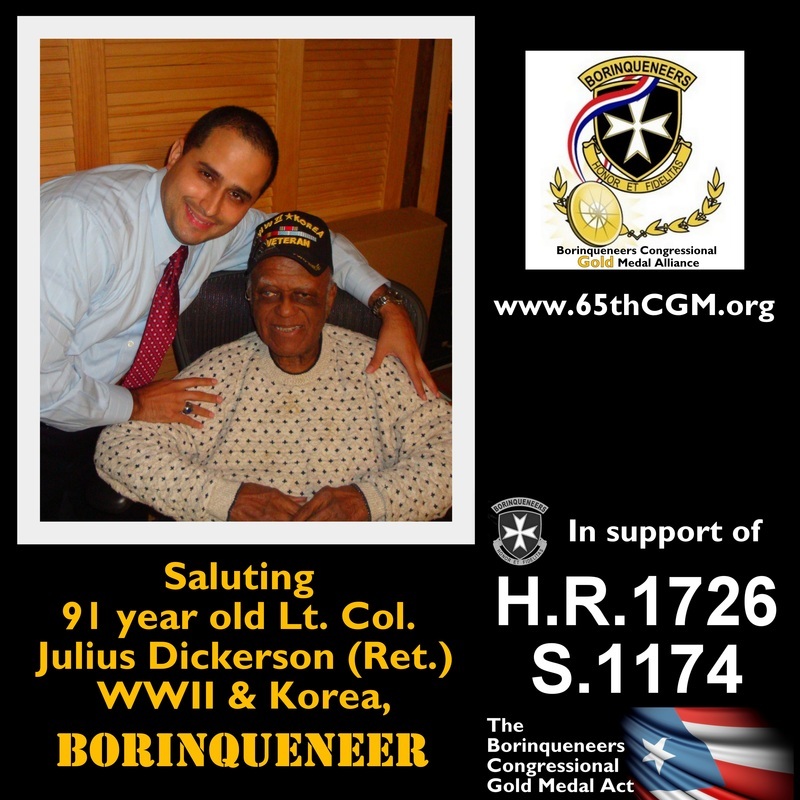 Pictured: Borinqueneers Congressional Gold Medal Alliance national chair Frank Medina at a recent meeting with Lt. Col. Dickerson. During Korea, although predominantly Puerto Rican, the Borinqueneers included some members of other nationalities, including African-Americans, Mexican-Americans, Filipinos, Virgin Islanders, & several others.